Polls allow your membership to communicate back to you on a broad range of topics. This is unlike most of the modules you might use on your website which function to transmit information from your organization to your membership. A poll can be on a broad subject such as a favorite season or it can be more narrow such as to ask an opinion of a guest speaker or anything in between. A minister could use a poll to ask the member’s preference on where to travel to for a fall retreat or he could ask how many people would make use of or volunteer for a new ministry opportunity. The possibilities are nearly endless. Once you create a poll, you can display it on your organization’s Arena-managed website and Arena assigns each poll a Poll ID. You can place a poll on nearly any page of your internal Arena or Arena-managed website, with the proper Poll Category ID and Poll Results page settings. This feature requires two pages. Customize the Content Category Lookup. This Lookup is used with other features. 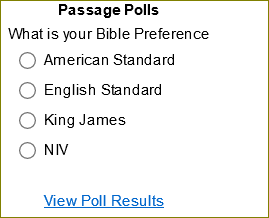 Polls page – This page allows users to participate in the poll. This page requires the Poll Display Active in Category module, with the required settings. Poll Results page – This page displays the results of the current poll, once the visitor participates. This page requires the Poll Graph Results module. This page should not be visible from basic navigation, as an ID must pass from the poll itself, and should be a child of your Home page. When using polls in your email subscription newsletters, you need to use the Poll Display Newsletter module with the same settings listed above because emails limit the HTML code allowed.